Police have identified the suspect behind the Resorts World Manila attack which resulted to 38 fatalities and wounded others. 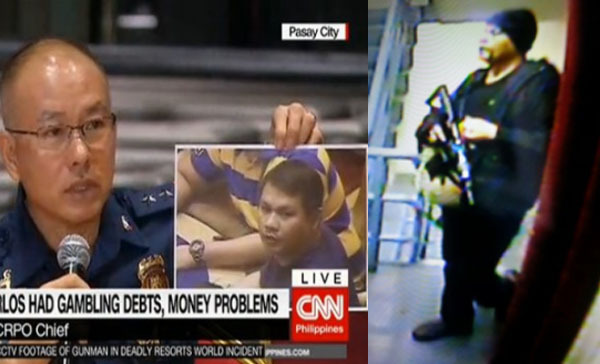 The lone gunman was identified as Jessie Carlos, 42 years old, a former employee of the Department of Finance. NCRPO chief Police Director Oscar Albayalde named the suspect in a press conference held at the Remington Hotel on Sunday, June 4, 2017. Jessie Carlos, a father of three and a resident of Sta Cruz, Manila, was “heavily in debt” due to casino gambling according to Albayalde. 37 people died in suffocation and dozens were injured at Resorts World Manila incident early Friday. Fatalities includes employees and guests. Jessie Carlos was found dead in a hotel room after committing suicide.